FREDERICTON, NB – Picaroons Traditional Ales has announced details of a new beer festival that they will be hosting in Fredericton this summer. 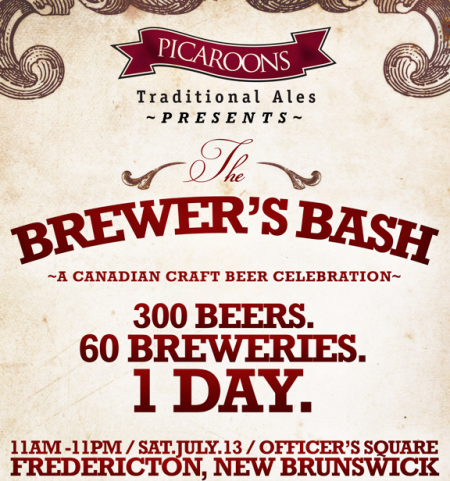 The Brewer’s Bash – subtitled “A Canadian Craft Beer Celebration” – will take place on Saturday July 13th in Officer’s Square (585 Queen St., Fredericton). The poster released yesterday promises that 60 breweries will be in attendance with 300 different beers, making it the largest craft beer festival to ever be held in Atlantic Canada. Tickets for The Brewer’s Bash are $25, and will go on sale next Tuesday May 14th at 10:00 AM.